You've been asking for it, and I'm finally going to deliver. 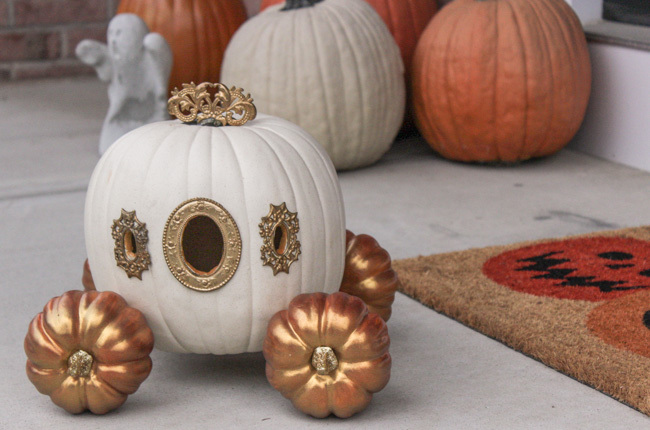 Everyone is always curious about how I made my Cinderella pumpkin. I've seen a few different versions of this online over the years using different items like belt buckles or just carving into the pumpkin without any decoration but I love how mine came out. I recommend using one of those foam pumpkins for this particular project so that you can use it year-to-year and don't have to worry about it rotting. You can find them at any craft store and they are on sale quite frequently (or you could use a coupon). However, feel free to substitute for a real pumpkin if you want. You'll just have to scoop out the guts before carving. 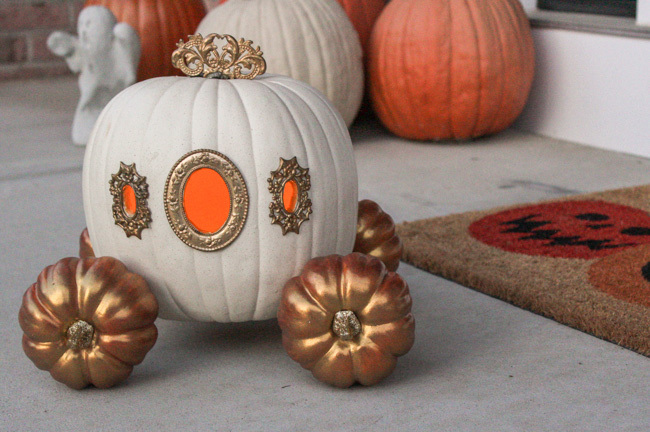 I also used fake pumpkins for the wheels, but you could substitute those as well if you want. I think the decorative hardware is what makes this look so great, but I've spent 3 years trying to figure out what those pieces are called so I could write this tutorial and have had no luck. I found these particular pieces at the Brimfield Antique Flea Market. A vendor had an entire tent of these beautiful gold pieces and when I saw them I knew they were perfect for making this so I grabbed them. I've searched online and asked many people and for the life of me can't figure out what they are called, or what they are for. I have had some luck searching the internet for antique furniture trim hardware and having similar pieces come up. For example, that's how I found this Etsy listing with pieces you could use. So if you look around you may be able to find them (or something similar) and if you know what they are please let me know down in the comments! If you can't find any pieces like this some other options are using wood pieces and spray painting them gold or using picture frames. First, cut around the stem as you would if you were carving a real pumpkin. I also cut the fake stem much shorter on my pumpkin and then painted it because of the gold piece I was placing there. Next, take the pieces that you're using for the door and windows and place them one-by-one where you want them to be when you glue them and trace negative space with a pencil so you know where to cut, but still have a place to glue the piece on afterward. Once you've traced all three you can use your knife or razor blade to cut them out. Then remove them from inside the pumpkin via the hole you made in the top when you cut around the stem. Now you're ready to hot glue all your decorative pieces on. Do this one by one and give them sufficient time to dry. While your decorative pieces are drying make the axels by taking the dowels and pushing them through the bottom of the small pumpkins with one on each end of the dowel. If it doesn't feel secure feel free to glue the pumpkins onto the ends. Note: You may have to cut the dowels to be the right size for an axel for your carriage, as you don't want the wheels sticking out too much. Next, glue the dowels to the pumpkin. Finally, place an electric tea light inside and place the cover back on. If you make your own I'd love to see it so email me lauren@petiteinpearlsblog.com or tag me on social media in your photo @laurenscorza. OhhhhMG! This is perfect for me! I want to make one!!! If you do, I wanna see! Omg that is such a cute idea!